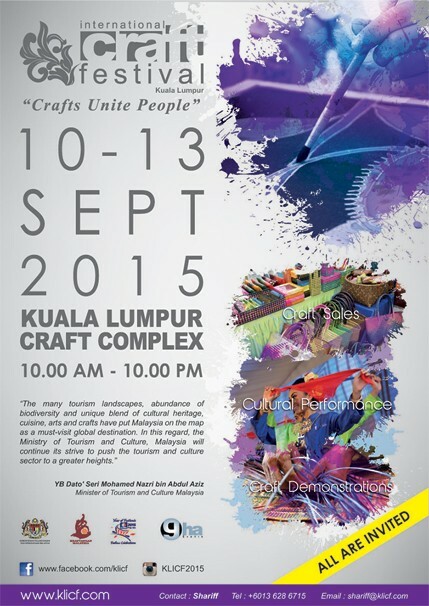 This year 2015 has been remarked as the Malaysia Festival Year(MyFEST) 2015 by the Ministry of Tourism & Culture Malaysia, In conjunction with that, The Ministry, through it’s agency, Malaysian Handicraft Development Corporation (Kraftangan Malaysia) has organised the Kuala Lumpur International Craft Festival 2015 (KLICF 2015) on 10th-13th September 2015 at Craft Complex, Jalan Conlay Kuala Lumpur. The objective of this international event is to promote the uniqueness of crafts from 32 countries around the world which consist of Azerbaijan, Brunei, Bhutan, Bosnia, China, Ecuador, Egypt, Ghana, India, Indonesia, Iran, Japan, Jordan, Kazakhstan, Kenya, Mauritius, Mexico, Morocco, Nepal, Peru, Filipina, Pakistan, Republic Of Guinea, Singapore, Sri Lanka, Taiwan, Tanzania, Thailand, Turki, Uzbekistan, Venezuela, United States of America and also from our own country, Malaysia. Total number of 430 international and domestic craft entrepreneurs, consist of 250 international and 150 domestic, will be participating in this event involving exhibitions, business activities, demonstrations and also culture performances along this 4 days event. We believe that each and every country has it’s own art in it’s craft so we have invited 20 demonstrators from all over the world and also from Malaysia to show their skills in creating their products to the audience. Malaysia is rich with a lot of cultures, traditions, religions and places which make Malaysia a perfect place to explore and shop. We, hereby would like to invite all of you to come and bring along your family and friends to bring success to this international event and to promote our Malaysian culture to the eyes of the world.